Alopecia areata (AA) is a common dermatological disease characterized by patchy areas of nonscarring alopecia. Trichotillomania (TT) is an expression of obsessive-compulsive disorder defined by the urge to pull out his/her hair. We describe a case of AA coexisting with TT. A 6-year-old male child presented with a localized patch of hair loss in the occipital area of 2 years duration. Dermoscopy revealed numerous exclamation mark hairs along with signs of scratching and bleeding. A detailed medical anamnesis and thorough examination of the child during the consultation put in evidence TT. Alopecia areata (AA) is a common dermatological disease characterized by patchy areas of nonscarring alopecia., Trichotillomania (TT) is an expression of obsessive-compulsive disorder defined by the urge to pull out his/her hair. We describe a case of AA coexisting with TT. A 6-year-old male child presented with a localized patch of hair loss in the occipital area of 2 years duration. Dermoscopy revealed numerous exclamation mark hairs along with signs of scratching and bleeding. A detailed medical anamnesis and thorough examination of the child during the consultation raised the clinical suspicion of TT. 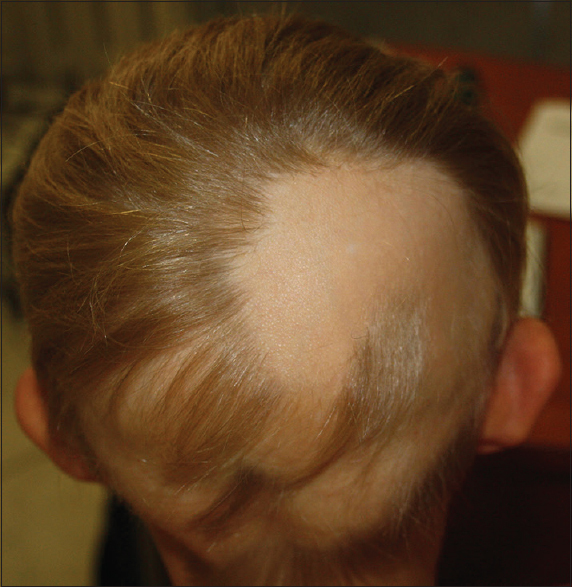 A 6-year-old healthy boy was addressed to the Dermatology Outpatient Clinic for a patchy alopecia on the occipital area. Members of the family have noticed the alopecia and its slow progression over the past 2 years. The child was in good health state, receiving no medication, no allergy background, and no family history of alopecia. At clinical examination, smooth, oval patches of nonscarring alopecia were seen on the occipital area [Figure 1]. The hair pull test was strongly positive in the perilesional skin. Trichoscopy revealed numerous exclamation mark hairs and confirmed the clinical diagnosis of AA [Figure 2]. At the edges of AA area white, short vellus hairs, and dystrophic hairs were noticed together with black and yellow dots. 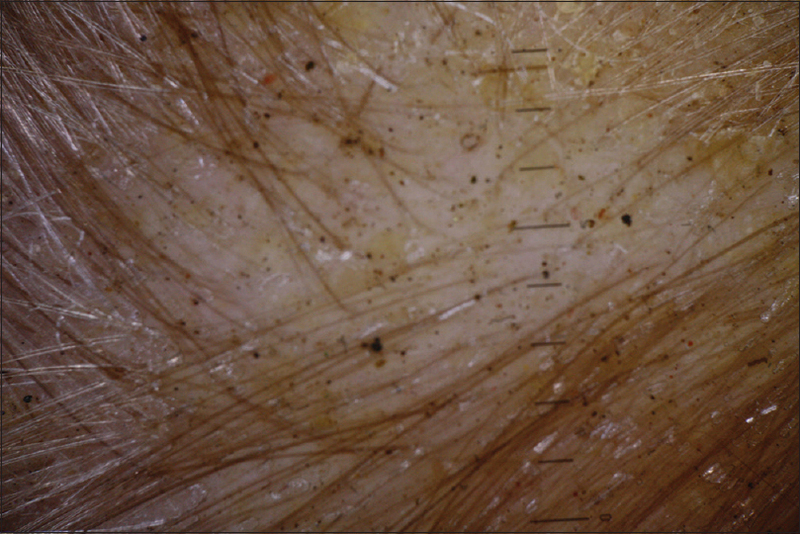 On further examination, several tiny asymmetrical patches of alopecia measuring about 2–3 mm in diameter were also observed, associated with scratching marks and bleeding [Figure 3]. The hair pull test was negative in the perilesional skin. On trichoscopy, a number of broken hairs were observed. Direct mycological examination of the hairs from the lesional skin did not show any fungal elements. There were no other signs or symptoms of dermatological disorders either in the skin or nails or hair. The child had a positive family history of atopy. Extensive laboratory investigations such as complete blood cell count, serum chemistry, and thyroid function tests were all found to be within normal limits. Only slight anemia was proved. Because of the suspicion of TT, an interview with the child's parents was asked and they approved that the child was hyperactive, and he was seen several times pulling out the hair. The patient demonstrated the self-injurious behavior on clinical examination which confirmed the clinical suspicion even at that point. Treatment for iron deficiency anemia was started with Sorbifer accordingly to the age and recommendation of topical potent steroids for AA was prescribed. A psychiatric evaluation was asked, psychological counseling and therapy were recommended for the child and parents. The patient was seen again in consultation 8 months later, and positive results were remarked. TT, also known as hair-pulling disorder, is mostly a psychiatric disease with dermatological signs. The persistent habit of pulling out the hairs may be severe and chronic, inducing alopecia, especially in children. The diagnostic is based on clinical grounds, but can be complicated or delayed by constant denial of hair pulling by the patient or family members. TT must be differenced from trichoteiromania in which patchy alopecia is induced by compulsive rubbing of the hair. Trichoscopy gives valuable data, making the difference between AA where yellow dots, exclamation mark hairs, and proximal tapering hairs could be seen, in contrast with TT where trichoptilosis and pointed hairs are specific. Sometimes scalp biopsy can be done to confirm the diagnosis, but it is an invasive procedure, not accepted, especially in children. Psychiatric profile of a child diagnosed with TT has been evaluated in many studies, confirming the family and personal history of a psychiatric disease. AA is also associated with a preceding stressful event, but not all cases of AA confirmed this hypothesis. Stress at school and home have been considered also as contributing factors to TT. TT can be associated in the same child with other tics such as nail biting and skin picking. The coexistence of TT and AA in the same patient, during childhood, have been reported during the last years. The present case is distinctive by the association of AA and TT in different anatomical sites. It is quite difficult to evidence TT within plaques of AA. On dermoscopy, the presence of the sign of “follicular microhemorrhage,” meaning a red dot that corresponds to a follicular ostia stuffed with blood clot, may suggest a local trauma, a clue for TT. The present case highlights the importance of vigilant medical examination, watchful observation of the patient during consultation, thorough clinical history obtained from the members of the family, which could lead to an accurate diagnosis and provide appropriate care and psychological counseling. Trichoscopy provides clues for differential diagnosis, especially when two types of alopecia are associated: AA and TT. Self-induced skin lesions are very common in pediatric patients with psychiatric disorders. They are typically readily recognized, and proper treatment or referral should be promptly undertaken. The patient demonstrated the self-injurious behavior on clinical examination, which should have led to the diagnosis at that point. The extent of testing performed are not necessary, and collaboration between dermatologist and psychiatric is the golden standard approach. Kato Y, Yamamoto T. Vitiliginous lesions during contact immunotherapy for alopecia in a patient with autoimmune thyroiditis. Our Dermatol Online 2014;5:308-9. Jain N, Doshi B, Khopkar U. Trichoscopy in alopecias: Diagnosis simplified. Int J Trichology 2013;5:170-8. Malhotra S, Grover S, Baweja R, Bhateja G. Trichotillomania in children. Indian Pediatr 2008;45:403-5. Leroux MB. Importance of the trichoscopy in scalp dysesthesia. Our Dermatol Online 2013;4:501-2. Abraham LS, Torres FN, Azulay-Abulafia L. Dermoscopic clues to distinguish trichotillomania from patchy alopecia areata. An Bras Dermatol 2010;85:723-6. Tay YK, Levy ML, Metry DW. Trichotillomania in childhood: Case series and review. Pediatrics 2004;113:e494-8. Bhalla M, Sarkar R, Arun P, Kanwar AJ. Trichotillomania. Indian Pediatr 2003;40:52-6. Ise M, Amagai M, Ohyama M. Follicular microhemorrhage: A unique dermoscopic sign for the detection of coexisting trichotillomania in alopecia areata. J Dermatol 2014;41:518-20.